One of the perks of being an engineer at the district is one gets to go out and visit places. This one was shot while inspecting an oil and gas production plant up in Newhall. It takes one up on the remote hills that resemble the landscape of the old west. [Insert Rawhide song here: Rolling, rolling, rolling ....] I was told that the area has been used in shooting the television series CSI and Lost. The place may have been visited by the Manson Family. Yikes. The wildlife activity or inactivity looks deceiving. Apparently at this time of the year there are rattle snakes, coyotes and who knows. The whole time we were making noises with our shoes to ward off the snakes. By the time I got back to the office my brown shoes turned ashen gray. So was the bottom half of my jeans. Once we saw a jack rabbit and a squirrel. Our host said that those were good signs because they would mean that we were safe from coyotes. Next time I'm bringing a gun. Okay, I'm kidding on the gun part but not on the critters. Techie Notes: The picture was stitched from three images taken with the Fujifilm Finepix X100. If you pretend to draw vertical lines and divide the picture into three sections and look closely. You'll notice that there is darkening on the blue sky where the imaginary lines fall. This is because the individual shots have vignette cause by the camera lens. Vignette is apparent in all lenses but some are more obvious. I tried to lighten those parts but since I was doing this just for fun I didn't spend much time on them. Now if this was something I'll submit to a photo contest, then I might work at them more. This is one of the few ones I didn't do much processing. Tweak the contrast on the details of the hills and applied neutral density gradient on the sky to darken it a bit. 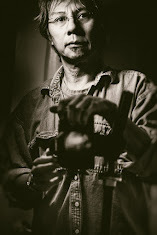 Rob Castro is a retired engineer and an artist-photographer. He worked for the government for over 25 years in the field of air pollution control. In January of 2014, Rob retired from government service so he can focus on his artistic endeavors. Although he has no formal training as an artist, Rob had an early start in developing his artistic talents. At the age of five, he drew a picture of the devil while a student at a parochial school. This got him in trouble with the nuns but it also affirmed his calling to be an artist. Back in 2008, Rob took up photography using a cheap low-tech camera but with a firm resolve to make good use of it. Since then, Rob has published some of his photos through photography periodicals and as book covers. One can also view Rob’s concept photography work on his website, Just an Observer (http://www.justanobserver.com/) and through his published photo books. Licensing of his works is available through Arcangel. Royalty free images are available at Getty Images. Or you can just contact him at juznobsrvr@gmail.com. Rob and his wife Rose are parents of one daughter. They now reside in Georgetown, Texas. Their dog Mimi, their cats Jerry, Heraclitus and Tiger Hendrix are all greatly missed. All photos © 2019 Rob Castro. All Rights Reserved. If you like what you see, perhaps you can help a struggling artist defray some cost so he can continue to share his eclectic artworks and incoherent ramblings. Juzno will be very grateful for your generosity. No amount is too small. (c) Rob Castro 2013 and beyond. Awesome Inc. theme. Powered by Blogger.